"D.G. 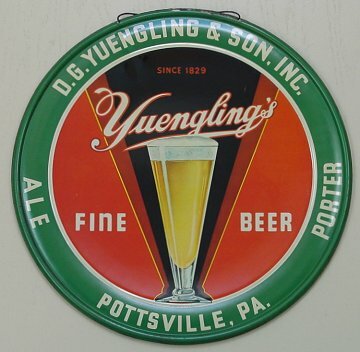 Yuengling & Sons, Inc. - Pottsville, PA"
Pottsville, Pennsylvania Comments: Now this is a rare piece. You hardly ever see the tray and this is the only time I have ever seen this sign. It appears to be the same printing as a tray and perhaps it is even a tray which has not been formed. If you have more info. regarding the great piece, please e-mail me. This tray also has a neat story. Several years back Ruddy mentioned the sign to me. He told me it was really a great piece and asked me if I was interested in it. At the time, I really wasn't, but his wife contacted me and said Ruddy really liked it and she wanted me to say I wanted it. I sent him a check, he sent me the sign, his wife sent me a check, I sent back the sign and you can imagine how surprised he was on Christmas morning. Well, now Ruddy is consolidating his collection and after having seen this baby in person, it was not hard for me to add it for real this time. A great piece.